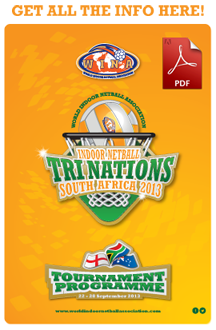 WINA TRI NATIONS 2013 - "SOUTH AFRICA"
South Africa closes the gap on Australia in the Masters Tri Nations. The Super Sixes proved to be an exciting affair. 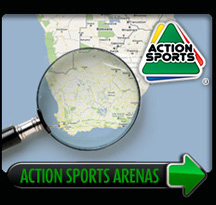 The Round Robin saw the SA 18 & Under Ladies win all their round robin matches and then failed at the Grand Final against a strong Australian side. Australia winning 36-31. The 18 & Under Mixed looked one side in the Round Robin but in the final South Africa created a stir by taking Australia to extra time eventually losing to Australia 51-43. The 30 & Over Mixed was also dominated by Australia in the Round Robin Matches and ran out winners 51-35 against a physical South African team. 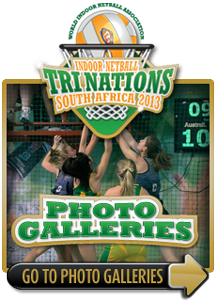 The 30 & Over Ladies saw South Africa take their first International trophy. Winning all their Round Robin Matches and dominating the final 50-37 against Australia. The Tri Nation 7's contest was held from the Thursday to Saturday after the rest day was spent on a Soweto Tour by Australia and England, while the South Africas had a practice session. In the 18 & Under Ladies, South Africa again dominated the Round Robin Matches and with the Match being recorded for TV purposes, it proved to be another close game in the final. Australia winning this one 47-46. An excellent exhibition of netball. The 18 & Under Mixed was no different to the 6's and Australia, after dominating the Round Robin, took the final 53-30 against Australia. The 30 & Over Mixed followed a similar story as to the 18 & Under Mixed, the Australians running out 53-38 victors against South Africa. The 30 & Over Ladies game which was also recorded, also proved to be another tight game. South Africa dominated in the Round Robin section, but Australia weren't going to lie down. The final was played in front of an ever building crowd and the support for both sides was there for all to see. At the end of the final quarter, the teams were deadlocked and extra time was played. End to end the goals were dropping in and after the final whistle was blown, South Africa took their second trophy winning 63-60. What a game!!! 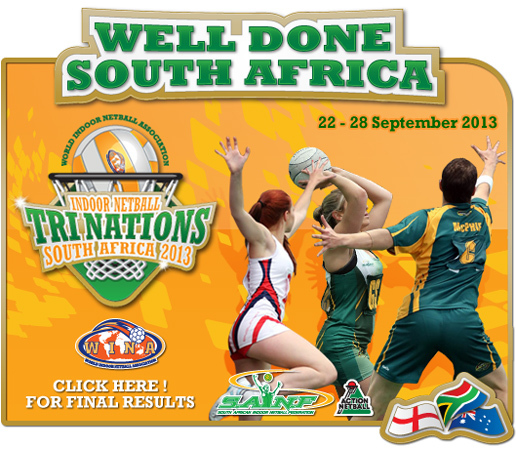 WINA TRI NATIONS 2013 - "SOUTH AFRICA TEAMS"
On behalf of Action Sports SA and the SAINF, we would like to congratulate all the following Managers, Coaches and Playersthat Participated in the WINA Indoor Netball Tri Nations South Africa 2013 Tournament.